White Rock is an interesting little enclave south of Hwy 99. There is everything you need there including all the big box stores and chain restaurants. For many, it's got a great view and comfortable surroundings. Of course those properties command a premium and yes, there are many affluent residents. So it begs the question, why aren't there more upscale eateries? Yes, there are some found on Marine Drive, but that is a totally different animal as it attracts many tourists and others from the Lower Mainland. Yet, how about a place where one could visit more than once and doesn't command a locational premium? 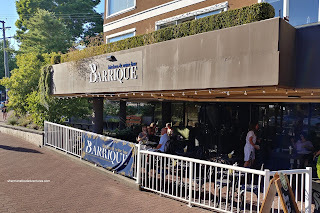 Well, Mijune and I were trying to find out if the newly opened Barrique could fill that niche. We ended up doing the "Trust the Chef" tasting menu in addition to other dishes (yes, Mijune needs to eat lots!). 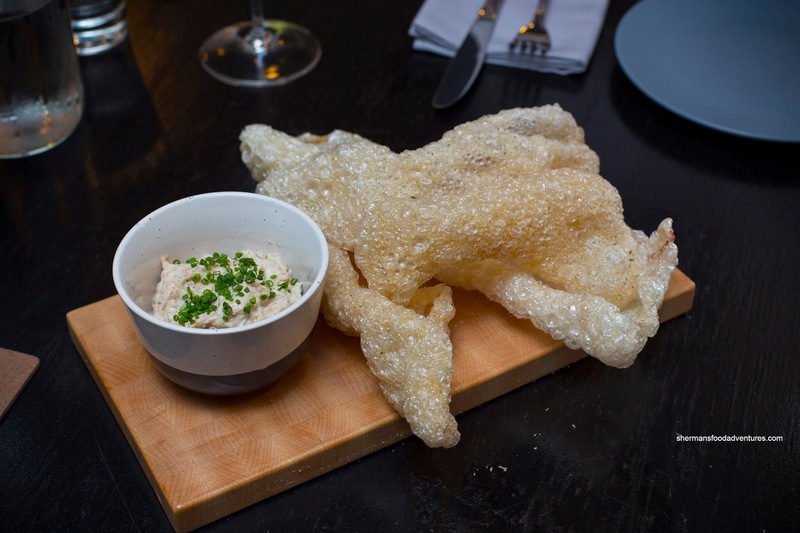 The first plate was the Chicharrons with sour cream & onion dip. These were perfectly airy and crispy. I'm sure the synchronized crunch from our table resonated throughout the room. 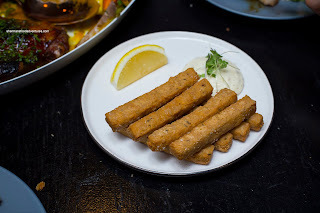 They were liberally dusted with salt while the dip was an excellent compliment. It was thick, creamy and had an appealing sweetness from onion. Next, we were served the House Made Brioche with truffle butter. Cute and small, the mini-loaf featured a crispy outer crust while the inside was classic soft brioche. The whipped truffle butter was smooth and creamy with a definite hit of black truffle earthiness. Normally a bowl of Olives doesn't elicit much of a reaction, but these were pretty darn good. Mind you I love olives, so I get pretty happy if there are some on the table! 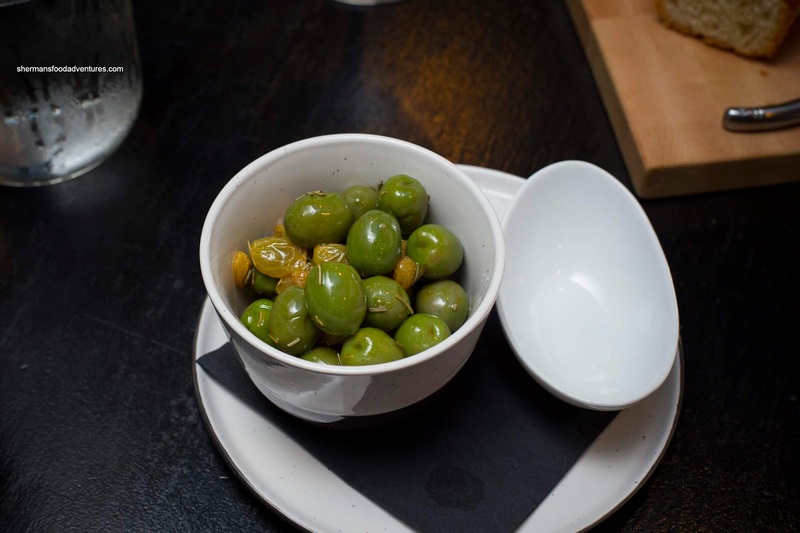 These were castelvetrano olives marinated with rosemary, EVOO and raisins. In addition to the generally mild flavour and meaty flesh of a castelvetrano olive, we found the woodsiness of rosemary and pops of sweetness from the raisins. Although there was not ginger present, there was a hint of it possibly from the flavour combination. We actually added the Panisse fries served with herb aioli further on in the meal, but I'll talk about them here. These were served hot and crispy. Inside, it was fairly fluffy and mildly seasoned. This would be a great snack with a cold bevvie. 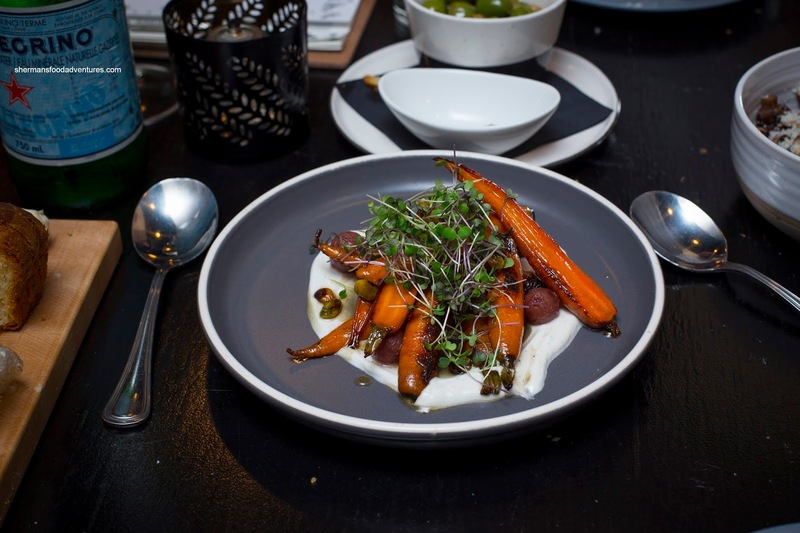 Onto some veggies, we had the Carrots roasted in honey butter served atop cracked pepper yogurt, pickled grapes and pistachios. In terms of aesthetics, this was colourful and nicely plated. Charred and caramelized, the carrots were earthy and sweet albeit a bit too firm (but a whole lot better than being too soft). Personally, I love tart and sour, so the grapes were perfect, but I could see for some it could be overwhelming. Covered with a plethora of pecorino, the roasted Mushrooms in brown butter sported the crunch of toasted hazelnuts. 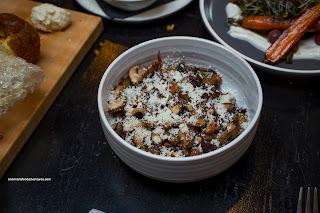 I enjoyed this dish as there was a fair amount of mushrooms for $12.00 (they really cook down!). They were not overdone, hence there was very little moisture on the bottom and the texture was meaty. There was definitely the aromatics from the nutty butter and also the salty cheese. 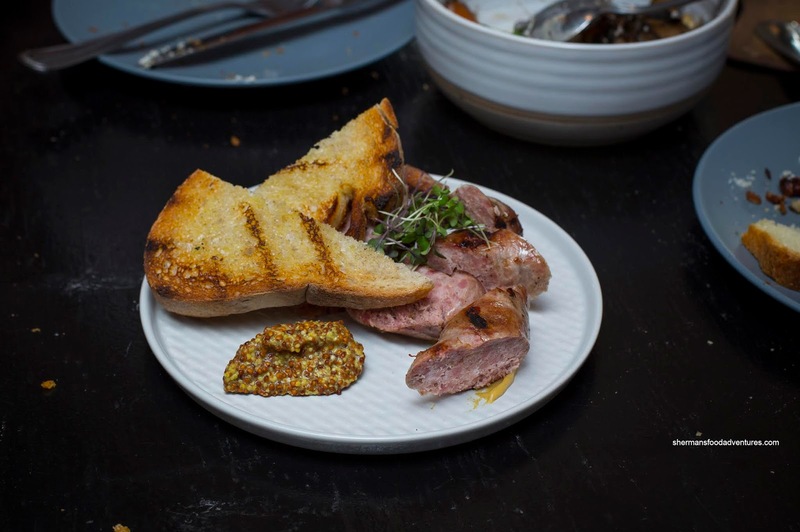 Enough with the veggies, we got down to business with some meat including the Boudin Blanc featuring house-made sausage served with 2 types of mustard and grilled sourdough. Yet another generous portion for $14.00, the sausage itself was meaty and lean. The mustards were definitely needed as the lean meat was on the drier side, but still good. On the other hand, the Honey Butter Chicken was succulent and juicy. 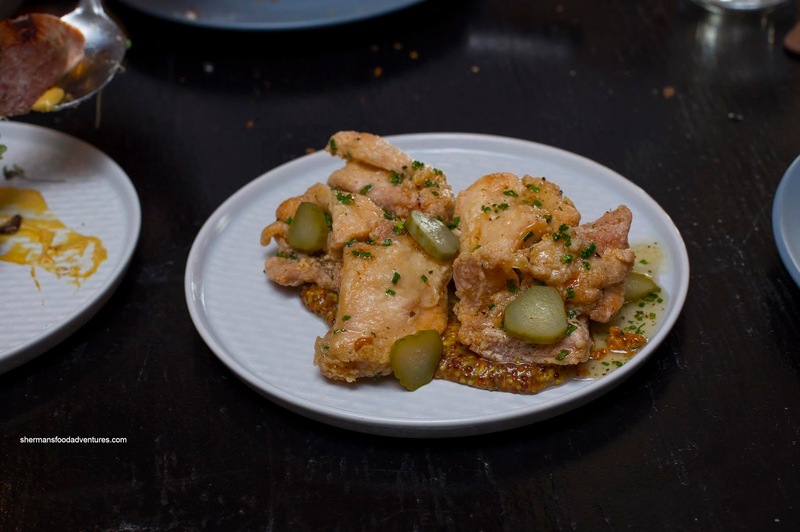 It sported crispy well-rendered skin that remained as such even though it was tossed in a honey butter while sitting atop dijon honey mustard. The chicken thighs were lightly seasoned so that they weren't bland without the sauce. However, combined together, there was this sweet and tangy thing going on which was aided by the pickles. 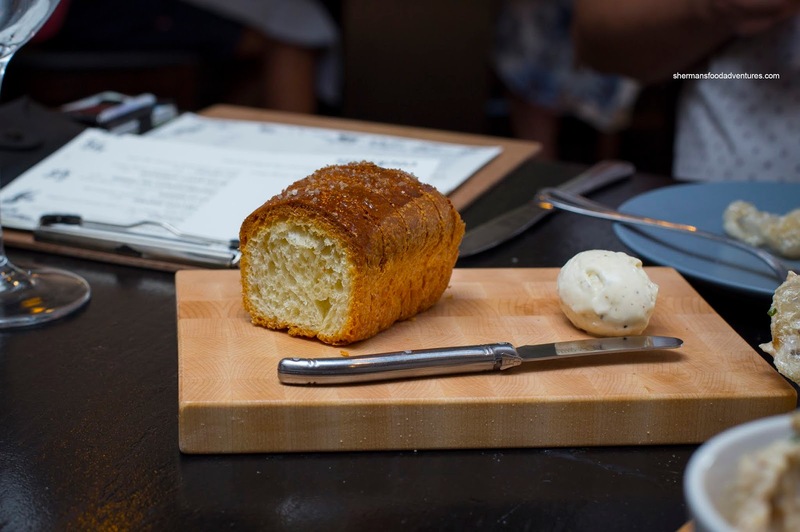 Back to the house-made brioche, we had that as the Foie Gras Toast featuring a healthy (oxymoron?) 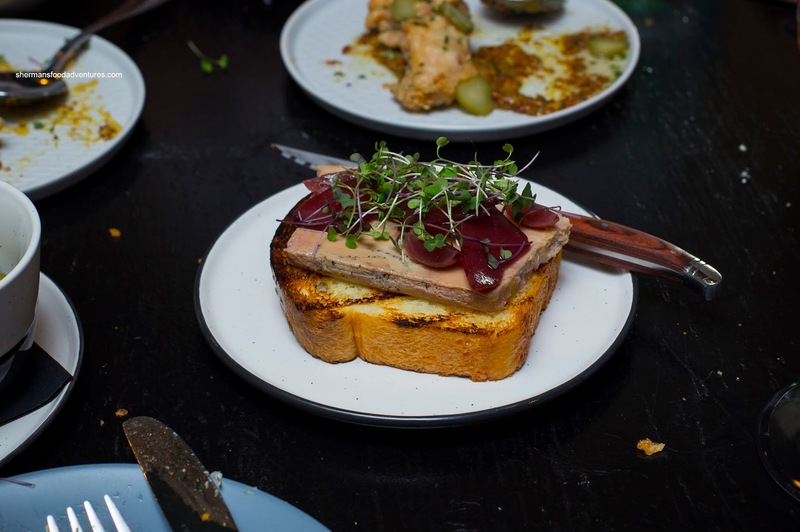 slice of foie gras terrine, poached pear, pickled grapes and dijon. Thick-sliced, the toasted brioche was crispy on the exterior and soft inside. The ample amount of terrine was creamy, buttery and decadent. It literally melted in my mouths and was nicely contrasted by the crispy toast. Adding acidity, tang and sweetness, the grapes and pears were a necessary component. I guess with all the heavy food we were eating, another serving of veggies were in order. 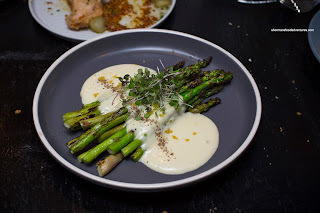 Hence, we were served the grilled Asparagus with hollandaise and preserved lemon. Yes, one can make veggies rich and creamy! These were perfectly prepared with a smoky char giving way to firm, yet fully cook asparagus. Although a bit powdery, the hollandaise was still silky and balanced. The preserved lemon added another layer of tang. Okay, heavy isn't even the right word to describe the next dish - #Beastburger. This thing sported an 8oz. 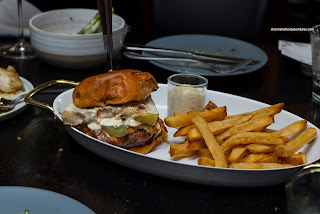 housemade patty, a thick slice of foie gras terrine, housemade dill pickles, caramelized onions, raclette, housemade bacon hollandaise and sour cream & onion spread. In terms of size, it didn't look physically large, but believe me, it was quite the monumental task in finishing it. Although cooked through, the lean burger patty was still moist and nicely charred. I found the melting terrine to be generous, but extremely difficult to keep within the burger. Add in all the sauces and there was plenty of moisture and richness. The pickles helped slightly in breaking up the heaviness while the bun stayed intact. However, this is definitely a fork and knifer. On the side, the fries were meaty with a firm crunch. 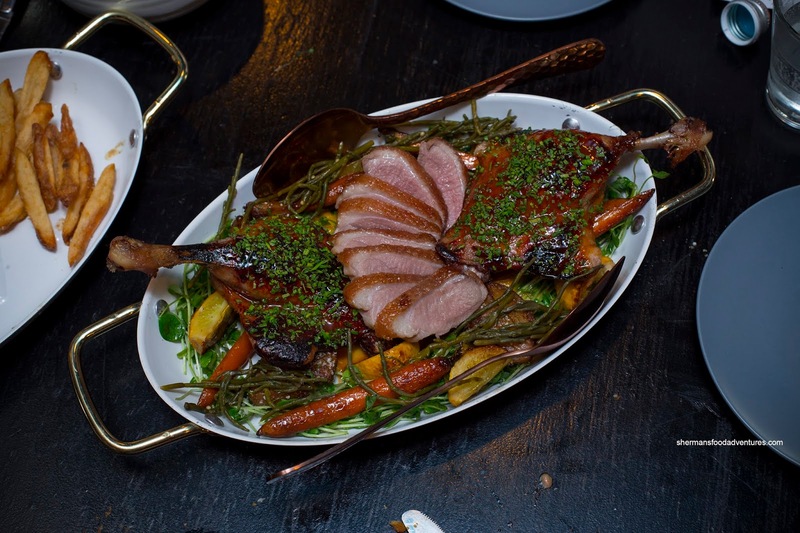 As if we needed anymore food, we were presented with a large platter of the Duck à L'orange featuring 2 confit duck legs and a seared duck breast. Underneath, we found squash puree, roasted root veggies and pickled sea asparagus. By far, the best thing on the plate was the plump duck legs. They were prepared expertly where the meat was succulent and tender. Moreover, the skin was completely rendered and slightly crispy (despite being coated with sauce). We enjoyed how the salt level was mild so that we could taste the natural duck flavour as well as the subtle orange. The duck breast was the correct doneness being moist and tender. We found the skin to be somewhat rendered, but lacking in crispiness. We could've done without the pickled sea asparagus though. Of course after a filling meal such as this one, we naturally had to get all of the desserts according to Mijune. 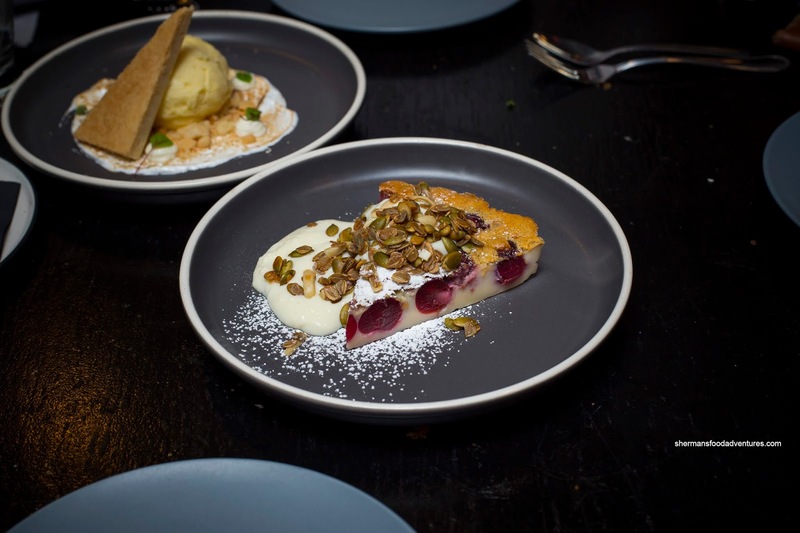 Stunning to the eye, the Clafoutis with fresh cherries, vanilla bergamot pudding and granola. Texturally, we thought it was too stiff, but the flavours were there being buttery with only a conservative amount of sugar. The cherries were ripe and delicious while the granola on top added a crunch. 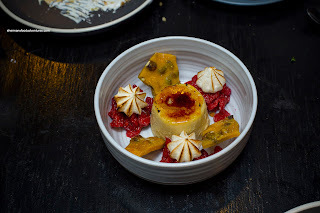 Completely deconstructed, the Lemon Tart featured a large scoop of lemon curd atop toasted marshmallow, crème fraîche and shortbread crumble (and a piece of shortbread on the side). I found the curd to be a bit dense although it wasn't a huge deal. It tasted great with a pronounced tanginess supplemented by just enough sweetness and a buttery finish. Light, buttery and crumbly, the shortbread was a nice textural compliment. Struggling to continue, I was beginning to tap out. However, we had 2 more desserts including the Rooibos Tea Crème Brûlée with cherry compote, toasted meringue and pistachio brittle. This was my personal favourite as the textures all worked. I found the custard to be silky smooth and just the right consistency. It wasn't too sweet where the tea essence really came through. Loved the ample tangy cherries and that brittle had a hard sweet and smoky crunch (only wished it was in smaller chunks). 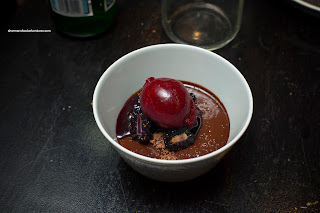 Lastly, we were presented with the Dark Chocolate Ganache with raspberry blackberry sorbet, chocolate soil and blackberry jam. They were very generous with the amount of thick and chocolatey ganache. We only wished it was a in shallower dish so it would be easier to scoop. 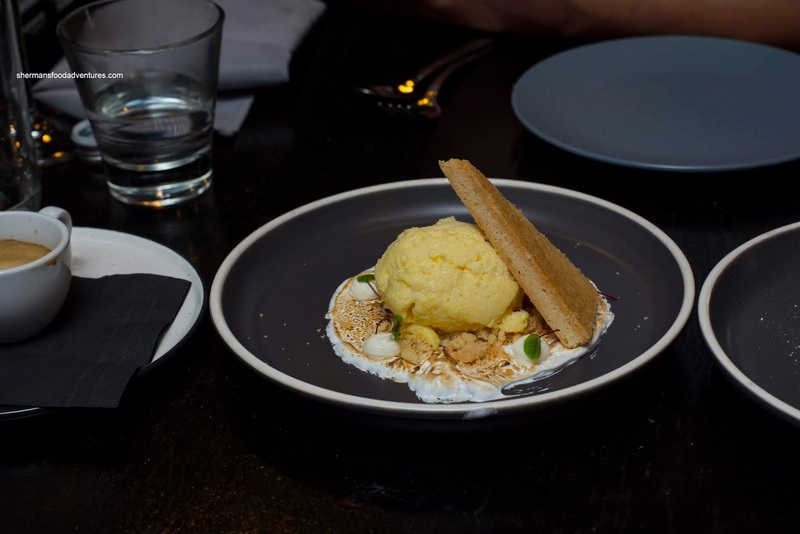 The tangy sorbet was a nice compliment and provided balance to the dessert. 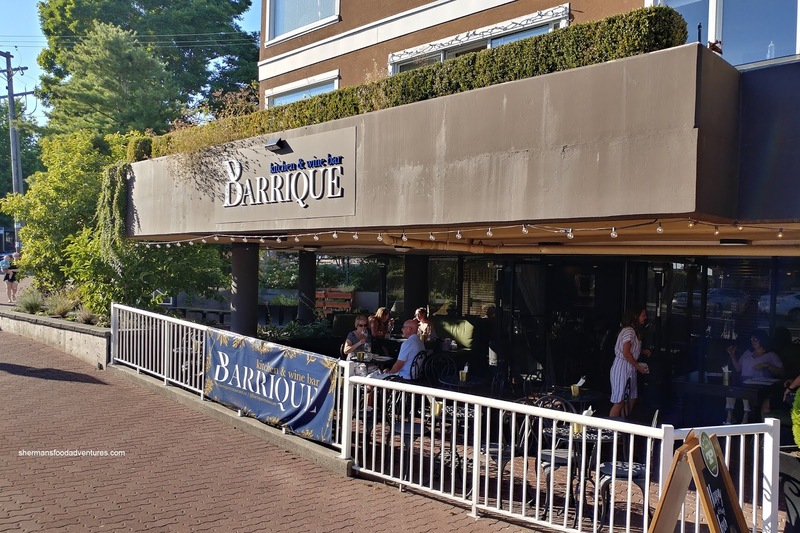 Phew... We made it to the end of the meal and yah, I'm not sure how Mijune does this... Anyways, the food at Barrique was pretty solid and definitely a nice addition to White Rock.